Born, raised and educated in New Jersey, Simon has remained true to his home state. Recently a widower, he continues to live there where he contributes theater reviews and features to CurtainUp, the print publication US 1 Newspaper, Princeton and his blog SimonSeez. He was married for fifty years to LucyAnn Saltzman, Professor of Speech and Public Speaking in the Theater Department of Drew University. With a short bow to practicality, Simon studied accounting and business law at Pace College, his heart always belonged to the theater. Even as he attempted to master the laws of debits and credits, he also studied acting and performed at the famed The New York Dramatic Workshop. During a stint of working for producer Saint Subber and passing the SEC/NASD exam he saw his name on a marquee for the first time, as associate producer of Gore Vidal's Weekend at the Broadhurst Theater in 1968. A year later he produced an Off-Broadway show under his own aegis — Frank Gagliano's City Scene starring Raul Julia, Michael Douglas and Lenny Baker. Finding his talents better suited to journalism than producing, Simon began writing theater criticism and features for numerous publications, a calling he pursues expertly and enthusiastically to this day. 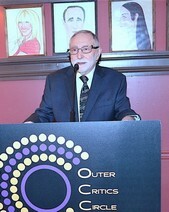 Simon is currently the President of the Outer Critics Circle. The theater bug has also bitten one of the Saltzman's two married children. Daughter Alice is the Associate Head of Acting Program for NYU students at the Stella Adler Studio. Alice's teenage son Ben has caught the acting/dancing bug with his eye on a theater career. Son James is Manager of Digital Media Service, University of N. Carolina School of Medicine, Chape ©Copyright 2016,Elyse Sommer.